A preschool in Mesa is a combination of a care center and a school kids aged 3-6 learn through play. Preschool dates back to 1895 when the kindergarten movement commenced. Daycare centers or preschools may be run privately, by a government entity, by a community organization, or by a local church. Licensed preschools in Mesa follow the minimum staffing requirements of employing graduates with degrees that are usually tied to education majors. Preschools are different from childcare centers; childcare centers are a more convenient option for working parents with toddlers looking for full-time, full-year care programs. Preschools, on the other hand, provide educational classes on a part-time basis usually a few hours every day 2-5 times a week and are often closed during school breaks, holidays, and summer. 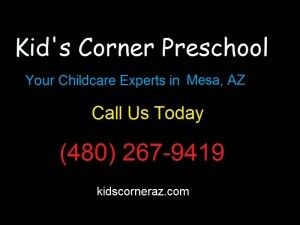 Why Enroll Your Child in a Mesa Preschool? As highlighted earlier, Mesa preschools nurture a child’s social and academic skills by developing healthier and stronger brain architecture. Studies show that the experiences children have in their early years of life have profound effects on their future. Our discussion will deliberate on how preschools aid in the development and why parents should enroll their kids in a pre-school. Children who enroll for preschool classes tend to have a higher chance of academic achievement and success, reduced grade repetition and special education needs. Additionally, children who attend high-quality preschool classes learn richer vocabularies and math skills and develop better pre-reading skills. Naturally, kids feel secure and cared for at home, but through preschools, they get to spend time away from their parents and build trusting relationships with other adults. Research shows some of the long-term impacts of early education include developing stable social and emotional skills that allow individuals to interact appropriately in their adult life. Additionally, children thrive in environments where there is consistent care between school and home. Preschools create warm relationships between kids and teachers thus building trust and a close personal connection. Since teachers value parents’ role in the child, they provide daily reports on the kid’s activities and arrange regular meetings for in-depth discussions with the teachers. Ultimately, it is about making the right decisions as a parent. Do you want to give your children every advantage they can to succeed later in life? One of the best ways is enroll in a Mesa preschool.